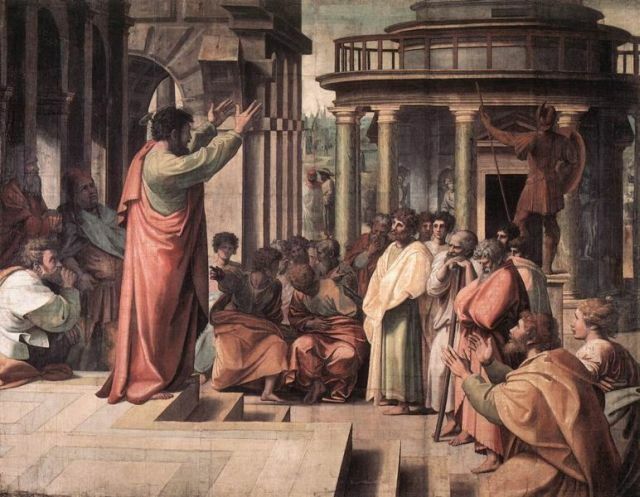 While Paul was preaching the gospel at Berea, the Jews from Thessalonica persuaded the people. So the brethrens sent Paul away to Athens. However, Silas and Timothy remained at Berea. Paul came to Athens and he sent message for Silas and Timothy to meet him there. While Paul was at Athens, he saw people worshipping all kinds of idols. So he went in to the synagogue and preaches the gospel to the Jews and Gentiles. While Paul was at Athens, the Epicurean and Stoic philosophers brought him to the government council of Athens called Areopagus. Paul stood among the Areopagus and said, “I perceive that the people in your city are very religious and worshipped many kinds of idols. God created everything in this world. Therefore he cannot be worshipped what the things that human made. Now God will let you go while you worship all these idols but He already had appointed at time during the end times when He will judge everyone. Those who do not worship Him will be thrown into Hell. God is calling everyone in everywhere to repent from their sins. When the people heard Paul talk about Jesus’ resurrection, they do not believe. Some of the people who believed Paul includes Dionysius from the Areopagus council and Damaris. Paul departed from them.